With the Federals working their way down from the north, and already occupying the river’s southern outlet at New Orleans, a siege of Vicksburg was almost inevitable. But taking Vicksburg was an imposing challenge. Its big guns kept the river clear of Union blue, and the city’s marshy landward approaches were tough-sledding at best for an attacker, and were made even more perilous by Confederate snipers and saboteurs. In 1862, Admiral David Farragut tried repeatedly to capture Vicksburg along the Mississippi, but the big guns chased him back. General Grant tried the landward approaches and had no better luck. With General Sherman defeated at Chickasaw Bluffs (in December 1862) and Confederate cavalry ravaging Grant’s communications and supply lines, the Federals were forced to withdraw. But in 1863, Grant came again. His plan this time was to skirt the big guns through elaborate engineering works— building a canal, diverting the river—all of which came to naught. But in March 1863, Grant decided on a bold maneuver. He would march his men down the Louisiana side of the river, cross it well south of Vicksburg and then swing round and attack—marching all the time through enemy territory. Rear Admiral David Porter, meanwhile, would reinforce his gunboats and, in a perilous gamble, run them by the fortress at night. On 16 April and 22 April 1863, Porter made his two daring passages under the guns of Vicksburg with spectacular success. The air was lit with fire and flame, but his losses were minimal. The focus now shifted to Grant. Grant’s plan was to isolate Vicksburg, marching first to Jackson, Mississippi, cutting off the citadel’s line of retreat and source of supply, and then invest the rebel fortress. Starting with 50,000 troops (a number that would grow to 77,000), divided into five corps, Grant faced 30,000 Confederates who were strung out defending too many points with too few men. Of the major battles of this campaign, four deserve attention. The Battle of Port Gibson (1 May 1863), conducted one day after Grant landed his men across the Mississippi River at Bruinsburg, led to the Federals achieving a foothold twenty-five miles south of Vicksburg. The Confederates had mounted a gallant defense, but had been outnumbered three to one. At the battle of Raymond (12 May), near Jackson, the bluecoats again outnumbered the Confederates three to one (and in artillery seven to one) and again the Confederates withdrew but only after a stiff fight. At the Battle of Jackson (14 May), Grant marched into Mississippi’s capital city, which Confederate general Joseph E. Johnston had decided to abandon, and destroyed its railways and industry. The climactic battle before the siege of Vicksburg Campaign was at Champion Hill (16 May) twenty miles east of the city, where 32,000 Federals, under General Grant, collided with 22,000 Confederates, under General John C. Pemberton. In a hard fought contest, a Confederate counterattack nearly reached Grant’s headquarters. Saving the day for the Federals was General Marcellus Crocker (leader of “Crocker’s Greyhounds”) who threw two brigades of bluecoats against the rebels and saved the Federal line. The Confederates retreated to Vicksburg. Grant first tried to take Vicksburg by storm. But he underestimated the strength and stubbornness of the Confederate defenders. After five days of knocking Federal troops against the Confederate wall, Grant decided to shell and starve the Confederates instead, while continuing offensive probes and calling for reinforcements. The shelling of Vicksburg was so intense that its citizens dug a system of caves in which to live. By July Confederate General Pemberton realized the game was up. He had been waiting for reinforcements from General Joseph E. Johnston, who despite having orders and reinforcements to save the city, would take no such risk. Pemberton wanted to fight his way out, but his subordinate generals thought this quixotic, given how ill fed and badly outnumbered the men were. Pemberton conceded this and on 4 July 1863, nearly 30,000 Confederates—and the city of Vicksburg—were surrendered to U.S. Grant. The 4th of July became a day of mourning, rather than celebration, in Vicksburg. Losing Vicksburg meant the loss of the Confederate West. The Mississippi River belonged entirely to the Federals, who captured the last remaining Confederate strongpoint, the besieged Port Hudson, Louisiana, on 9 July. In the next two episodes Scott and James will discuss the Siege of Vicksburg. In the summer of 1863, Grant’s Army of the Tennessee came to Vicksburg, located on a high bluff converged on Vicksburg, a Mississippi town on the same river. Union occupation of the town was critical to control of the strategic river. If it fell then the Confederacy would completely lose access to critical supply lines in Texas and Mexico. Grant’s six-week campaign began in June. His army came to Vicksburg, which was defended by Confederate General John C. Pemberton’s men, who built a series of trenches, forts, redans, and artillery lunettes surrounding the city. Grant’s army surrounded Pemberton and outnumbered him two to one. Trapped for six weeks, the residents of Vicksburg were forced to dig caves and eat rats to survive. But, due to Pemberton’s diligence and resourceful mind, they continued to trust his command despite dire circumstances. After the capture of Corinth on May 30, Halleck and the Union army in the west did little. In July of 1862, Halleck was promoted to General-in-Chief of all U. S. armies and transferred to Washington. Braxton Bragg was put in command of all western Confederate forces, replacing Beauregard. Bragg shifted 35,000 men by rail from Corinth to Chattanooga, TN. In September and October 1862, Confederate forces attacked the Federals at Iuka and Corinth, but both times, Grant and his army fought them off. Two Confederate armies, one under Edmund Kirby Smith and one under Bragg, left Chattanooga in August 1862 and marched into Kentucky. Union general Don Carlos Buell marched from Nashville to stop the rebels. The two armies met at Perryville, KY on October 8. There were about 4200 Union and 3400 Confederate casualties. 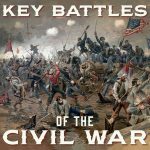 The battle was inconclusive, but since the Confederates retreated back into East Tennessee, the battle was a strategic Union victory. This was the last time the Confederates mounted a major operation to take KY.
Buell did not vigorously pursue Bragg’s army. Lincoln fired him and replaced him with William Rosecrans. In December 1862, Bragg’s army was camped near Murfreesboro, TN, southeast of Nashville. On the 26th, Rosecrans and his army marched from Nashville to challenge Bragg. By the 30th, the two armies were camped only about 700 yards from each other. (Story about the battling bands). Bragg attacked on the 31st, but the Federals held firm. Little happened on January 1. Bragg attacked again on the 2nd, but the Federals again drove the rebels back. Bragg then retreated back to Chattanooga. Rosecrans did not pursue Bragg, but nevertheless, the Union victory lifted northern morale. (Fun fact) Soon after the battle Rosecrans received a new chief of staff, a young Brigadier General named James A. Garfield. By June 1862, the Union controlled all of the Mississippi except for a 200-mile stretch between Vicksburg and Port Hudson, LA. 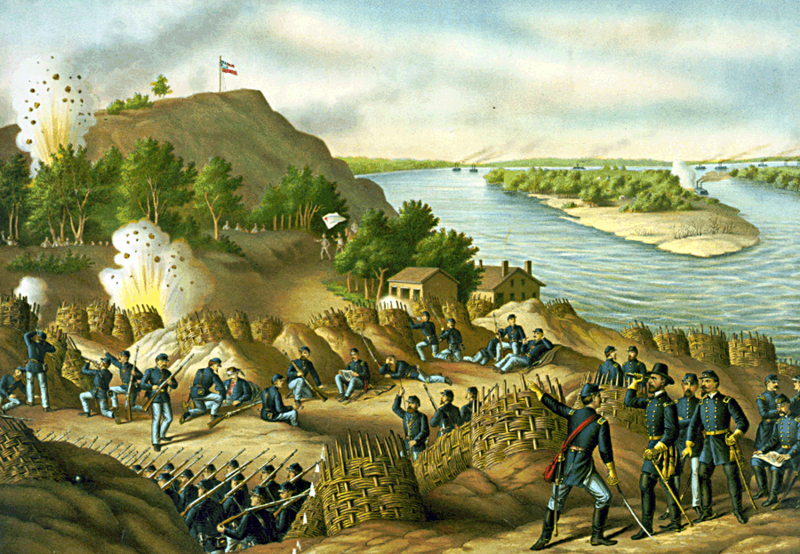 Vicksburg (“The Gibraltar of the Mississippi”) was on a 200-foot bluff, was heavily fortified (4 miles of batteries! ), and was seen as the key to controlling the Mississippi. Farragut ordered the Union flotillas at Memphis and New Orleans (which had a combined total of 220 guns) to attack the Vicksburg defenses. The attack was inconclusive. Farragut realized that the Navy alone could not take the city. The city could only be taken by an attack from the rear (the land side) combined with a naval bombardment. The city was defended by 10,000 entrenched Confederate troops under Earl Van Dorn. Farragut requested 3000 Union soldiers from New Orleans. They (along with 1500 contrabands) tried to dig a canal that would leave the fortress isolated. This effort failed, and hundreds of the soldiers, contrabands, and sailors died of disease. The Union gave up trying to take Vicksburg…for now. In December 1862, Grant made a new plan to take Vicksburg. Grant would march down from Tennessee with an army and attack the city from the east. He hoped to lure most of the small army defending the city (now commanded by John C. Pemberton) and attack it. Meanwhile William T. Sherman would take another force and attack the lightly-defended city from the North. As Grant marched southward, his army’s supply line was cut by Confederate cavalry under Nathan Bedford Forrest and Earl Van Dorn (now commanding a cavalry unit). This forced Grant to return to Tennessee. As Grant and his army were marching back to TN, they noticed that the countryside was rich with food and other supplies. He could have lived off the land. Grant abandoned his efforts. During the winter and early spring of 1863, he ordered that several canals be cut. He also considered using the Yazoo River. None of these efforts worked.